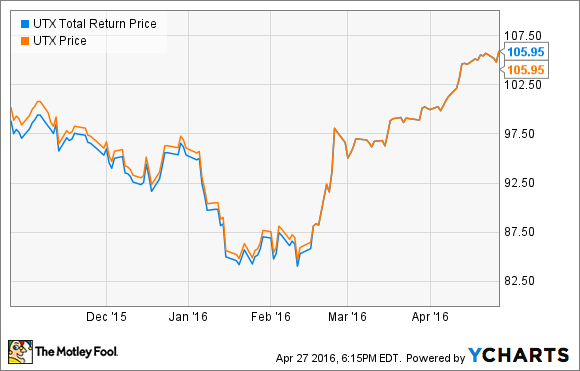 Can United Technologies Stock Soar Without Sikorsky? Valuation notwithstanding, investors seem to think so. But are they right? United Technologies stock has recovered nicely from its post-Sikorsky spinoff slump. UTX Total Return Price data by YCharts. It's been nearly six months now since United Technologies (NYSE:UTX) offloaded its Sikorsky helicopters unit on Lockheed Martin (NYSE:LMT). Against all odds, and despite taking a hit on profit margins, Lockheed Martin seems to be doing just fine with its new subsidiary. But what about the company that sold off Sikorsky? As it turns out, Lockheed Martin wasn't the only company updating investors on its earnings news this week. United Technologies also reported financial results -- yesterday, in fact. Here's what they had to say. Roughly flat revenue of $13.4 billion (up a small fraction of 1%). Operating profit margins of 14.6%, down 180 basis points from the 16.4% earned in Q1 2015. Net profits per diluted share down 6% at $1.42. Flat revenue and lower profit margins? This is not the result we expected from United Technologies offloading its low-margin Sikorsky business. But is the news as bad as it sounds? Not to hear management tell it, it isn't. Boasting of how "organic sales" grew 2% even if exchange rates prevented overall sales from growing, and noting that earnings per share were depressed by a nickel by "restructuring charges" post-divestiture, United Technologies CEO Gregory Hayes proclaimed his company is "off to a solid start in 2016." The CEO then went a step further and, in the face of unfavorable numbers, reiterated management guidance that UTC will produce additional organic sales growth of 1% to 3% this year, will earn between $6.30 and $6.60 per share (adjusted), and will come very close to producing free cash flow equal to reported net income. Investors seem to be buying the argument, bidding United Technologies stock up 1% after the report. But should they be buying the stock? Based on trailing-12-month results, United Technologies has now reported net income of $7.4 billion over the past year. Management's assurances aside, though, free cash flow for the period is something less than $2 billion -- less than 27% of reported income, and a long mile from the "free cash flow in the range of 90 to 100 percent of net income attributable to common shareowners" that management has promised for the full year. As a result, while some may look at United Technologies and see a stock selling for 12 times earnings, I prefer to look at the numbers a bit differently. First off, United Technologies' $88.6 billion market capitalization doesn't factor in the company's $21.7 billion long-term debt load, or its $7.2 billion in cash. Added to the mix, those factors give an enterprise value of $103.1 billion for the company as a whole. Divided by $2 billion free cash flow, they result in an enterprise value-to-free cash flow ratio of more than 51 -- which seems to me a pretty optimistic price tag investors are putting on the stock. Granted, if all plays out as planned, and United Technologies succeeds in topping out its guided free cash flow equal to "100% of net income," and if that net income also tops out the guided $6.60 per share, that will work out to free cash flow of $5.5 billion this year, and a more reasonable EV/FCF ratio of 18.7. I'm still not convinced that's a reasonable price to pay for the 9% long-term earnings growth that analysts are forecasting for United Technologies stock. But it at least implies a bit less wild-eyed optimism than is reflected in today's valuation.